Milton Keynes is Britain’s biggest new city. Its size and style have attacted international attention. Its inhabitants have come determined ‘to make a new start’. As one interviewee puts it “we’re all immigrants here”. The very newness and openness of Milton Keynes has made it an exciting, challenging and frustrating place to live in. 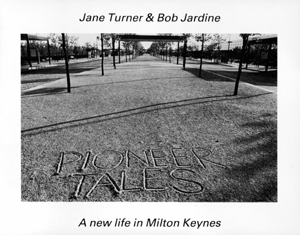 In this book, Jane Turner and Bob Jardine capture these feelings in photographs, and pioneers tell their tales. Looks like you have entered a product ID (107) that doesn't exist in the product database. Please check your product ID value again!